Every industry needs a low price leader to take charge with quality products. Often, that role is taken up by a lot of generic companies that don’t fill the niche correctly. GoPlus is a company that breaks that mold and shows how a value based brand can become an important name. As one of the lowest priced metal detectors on the market, the MD 4030 lives up to budget buyer expectations. You can operate with two modes for the best effect; all metal or DISC. All metal comes with built in ground balance and auto sensitivity while DISC is more exclusionary when searching. You can search while it is raining since the coil is waterproof, but it isn’t rated for underwater use. When using headphones the unit goes into a power saving mode since it doesn’t have to output external sound. This mode adds up over time, so if you exclusively use headphones then you can double the battery life of the unit. Taller users can adjust the stem up to 43 inches, while short users can dial it down to 33 inches. These small adjustments help to make the search period comfortable, especially when it goes on for hours at a time. Frequency of the unit is about 5 kHz, so adequate enough for a beginner that wants to find things in areas that don’t require ultra-high sensitivity. 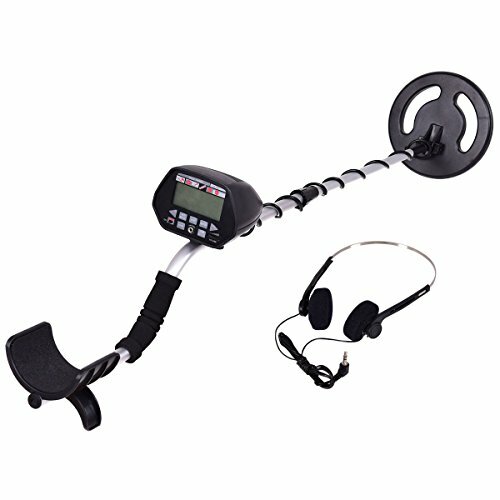 The MD-4030 is a good beginner metal detector, and may also be useful as a backup for professional users. When you want to get something a little stronger, the MD-3010II is the perfect match while still being low priced. It has LCD lights to help at nighttime, a crucial element when searches take you deep into the dead of night. Multiple options based on target acquisition help to filter out metals you don’t want while keeping the sensitivity high for the objects that matter the most. And a lot of the advanced features that are missing from the MD-4030 are available on this model, so reading the instruction manual is highly recommended. Along with all the new stuff is the usual inclusions like adjustable stem, headphone jack and a waterproof search coil. You can monitor the condition of the batteries with the indicator so that low levels never take you by surprise. The unit uses six AA batteries that last for a long time before needing replacing. Consumers that want to save money can even get away with using generic batteries if the cost makes it beneficial. Operating frequency is 7.5 kHz, so a nice bump up from the rest of the products in their lineup. The MD-3010II is a great buy if you plan on using at least half its features. Count this as another low cost metal detector from the GoPlus brand, this time one that is sensitive towards gold. There are two modes available, all metal and DISC. Using all metal will give you the most sensitive reaction when searching for metals while the DISC mode is more restrictive in what it searches for. With DISC mode you won’t waste any additional power with the device since you know exactly what it is you’re looking for. No stereo headphones are included, but you can use any standard 3.5 set to get incredible sound. Even at the highest output this GoPlus device uses a small amount of energy, requiring only a single 9 volt battery to power it. Heavy users can get a lot of mileage out of a single battery while using the all metal operational mode. There is nothing too advanced about the control panel, and it uses a basic setup to adjust settings. The view meter and pointer uses the traditional left to right swing method which is easy for anyone to follow. Blue LED indicators are the selling point of this metal detector, but it is more for aesthetics rather than usefulness. For looks and performance, this GoPlus metal detector delivers big. Last on the list is considered to be one of the best from the GoPlus line. It is a low cost device that is suitable for consumers and professionals. 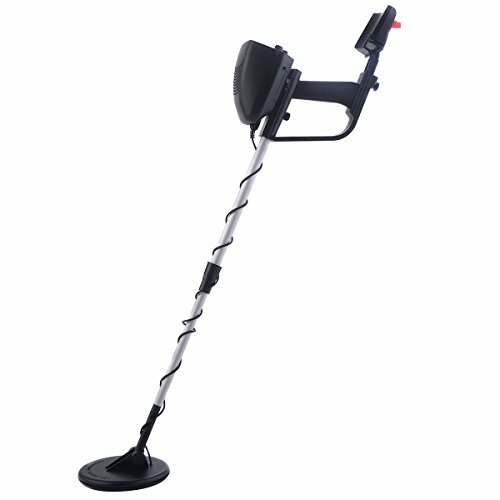 Made from high grade aluminum, it is a solidly built metal detector that ranks high on the durability scale. Two 9 volt batteries are required to power it fully, which makes this product a little different than the others in the GoPlus line. That doesn’t mean it is power hungry, with its 5.88 kHz frequency being average for the entire industry. But even at 5.88 kHz, both operational modes are strong enough to find objects or filter out ones you don’t want. GoPlus found a happy middle ground with the indication mode by using both sound and mechanical indicators. It’s a superior option that is meant to attract add professional flair to a low cost device. You won’t have any trouble looking at the display when it finds something since it is a spacious 4 x 5, suitable enough for most users. Headphones are included in the package, although batteries were left out. One thing to note is that although the product says waterproof, it is actually rainproof. That’s an important fact to point out for customers that want to use this in the water. If there was one metal detector you could buy from the GoPlus line, then this would be considered a top two choice. GoPlus is a small company that has made its name by making store branded products. You’ll often see them in your favorite brick and mortar stores, even with their increased online presence. No matter where you look they seem to be mixed in with the bigger name brands. GoPlus isn’t just in the metal detector game and makes everything from cleaning supplies to household furniture. They have even provided some of the extras that are bundled with your favorite big brand names. Despite their growing size, all of their prices are the lowest in the entire industry, regardless of the product they’re selling. Buyers that consider themselves bargain shoppers won’t find a lower priced metal detector than GoPlus, at least not without making some serious compromises. GoPlus is the bargain king and the first choice for entry level users. Professional users have purchased GoPlus when they need a solid backup for their high priced metal detectors. There are a couple of direct competitors that have offered similar low priced products, so the company isn’t alone with their smart pricing structure. Yet GoPlus still remains the most recognizable low cost metal detector available at the consumer and professional level. None of their metal detectors have what you would call a ‘killer’ feature, but they are still strong in areas where it matters the most. This can be seen in most of their completed feature sets that never lack any of the base options. Waterproof Search Coil – Buyers have come to expect this with all of the GoPlus metal detectors, even the older ones. They can be used in the rain without affecting the accuracy of the detection. Indication Modes – There is nothing complex about their indicators, even in their highest costing models. Anyone that isn’t familiar with the way metal detectors work will love using these simplistic choices. Lightweight – The materials used by GoPlus is lightweight, usually aluminum based. Balance is the key to their metal detectors so that users won’t feel like they are about to fall over form the extra weight. Usually the frequency is a number where the professional buyers make the biggest noise. A higher frequency determines how strong the coil is when finding materials, how far out it can search and the accuracy of finding those materials. Without good frequency, your object hunting will be a waste of time. Low frequencies can even lead to device filtering options not working correctly. GoPlus won’t be a leader in this area, but they still do a good job of outfitting their metal detectors with average numbers. Remember, these are low cost metal detectors meant for buyers that don’t want to spend a lot of money. GoPlus handles frequency without crippling the core functions of their products, even on the lower tier. A good point to make about the low frequency of GoPlus metal detectors is how it affects their power usage. By default, most of their models depend on a single 9 volt battery while the high tiers use double 9 volts. That points to a low use of power and even better long term usage on a single battery. In fact one of their top models only uses 55mA as its max usage. In standby that number is cut by more than half with 20mA max. When your battery is low in power a GoPlus model is more likely to squeeze out that last little bit of juice when you don’t have backups. You won’t get anything special out of the GoPlus design. All of them look the same, with no special color variations or ‘outdoor’ appeal. This is one area where an improvement would help, but not one that would turn off a potential buyer. GoPlus metal detectors are all business, with gray/black colors and a straightforward indication panel at the top. Without a great design, sometimes these models get overlooked by competitors- even when they have the same specifications. They’ve remedied a few of the design problems by adding extras (LED) to some of their newer models. Headphones – They won’t wow you with the included headphones. These were made exclusively for metal detecting, so the treble is high but the bass is non-existent. On closer inspection the headphones are generic with the same specifications of a pair purchased from Dollar Tree. Treble is the only thing that really matters for GoPlus devices, so buying an expensive pair of headphones won’t make much of a difference. The only downside is that you won’t be able to enjoy using these headphones with other devices. LED lights – Now this is something original and unexpected from GoPlus. Blue LED’s is a feature they added to the indicators so that it would stand out more. This is a pleasing aesthetic to the design, and is also helpful at nighttime when there is little light. It would be nice if more of their models came equipped with this feature to balance out the dull design. Durability is another area where GoPlus won’t wow you with results. They also won’t disappoint, so there is no worry of the product shattering into pieces when you drop it from a considerable distance. Smaller parts failing isn’t an issue, and it is more likely that misuse will make you call in the warranty. The biggest reason GoPlus metal detectors break has to do with a misunderstanding about their waterproofing capabilities. That’s something that will be covered later since it is not a brand error that can be blamed on GoPlus. Customers that want tough materials that can withstand going into jungle will want to purchase the higher end from GoPlus or another brand altogether. Despite the low price, these metal detectors are effective when finding various metal objects. They still won’t beat out the bigger brands when it comes to precision. 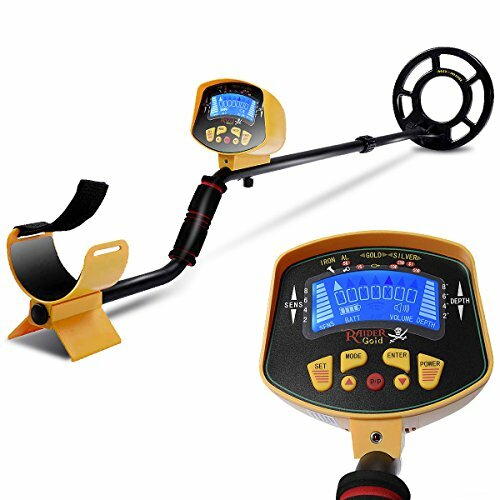 Buyers that purchase a GoPlus metal detector are doing it for the low price in relation to a promised build quality. They aren’t expecting to get the same precision as a product that costs 3x more. What buyers do get is a metal detector that is precise enough for the average user. It’s a good value, and a must for entry level customers that don’t want to jump headfirst into buying a high-end metal detector. The warranty provided is standard without any special extensions, so buyers that don’t use the product properly will have trouble getting a replacement. You only need to worry about this when you misuse the product by submersing it in water. A large amount of the warranty complaints comes from users that thought the entire product was waterproof. Buyers should read the manual from front to back to avoid any confusion with what is covered for their specific product. GoPlus isn’t stingy with their support, so in a case featuring actual damage the customer will be able to get a replacement. Now this is an issue that has more to do with marketing than it does with the brand. GoPlus metal detectors are branded as being waterproof when in reality they are simply rainproof. If you submerse a GoPlus metal detector in water it will be damaged. New customers that see the waterproof tag under the features will be blindsided by this, even more so when they realize the warranty doesn’t cover it. This has led to a lot of unfair negative reviews on some of the best products from GoPlus. In complete fairness to the brand, they are clear about the waterproof feature when you read their manual. There are two main modes to a GoPlus product; all metal and DISC. With these two operational modes they made using their metal detectors easy, even for absolute beginners. All Metal – No filtering is used in this mode, so it will find every possible object that meets the devices standards. Another way to think of this operational mode is ‘high power’. More energy will be used with all metal than any other mode as it reaches the max frequency to find your targets. DISC – Use this mode to filter out metals that you don’t want the detector to search for. It is an easy way to narrow down objects that you want the most without having to waste extra power. This low power mode is the best for saving battery power. Consumers have reported good precision when using the filtering options of DISC. Headphones from GoPlus are meant to be exclusively used with their metal detectors. They will work for any device that accepts a 3.5 jack, but you’ll be greatly disappointed with the sound quality. These headphones are meant for simple beeps and tones, and have been tweaked for high treble. Wearing the band for a long time won’t be uncomfortable, so at the very least the headphones are more comfortable than heavier models from competitors. On a scale of 1 to 10, the headphones that come with GoPlus is a 7. GoPlus is a wonderful choice for beginning treasure hunters. The company packs enough power into their devices to make searching for metal objects worthwhile. 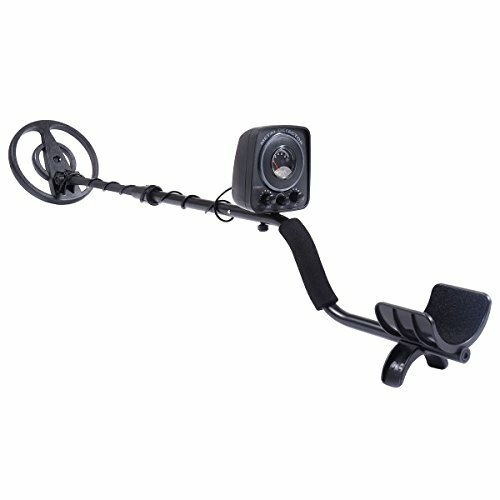 Even with stiff competition from expensive brands, it’s hard to deny the attraction of a GoPlus metal detector.